As you already might know, drones are not nearly as expensive as they were a couple of years ago when they first hit the mainstream market. Back then, they had enormous price tags and not a lot of people were able to afford them. Only those with huge salaries or proper drone enthusiasts were entitled to one. Luckily, those days are well past us as drones nowadays come in a huge variety of shapes, sizes and of course – prices. In this list, we are going to focus on the dirt-cheap drones under $50 that will not make a huge dent in your wallet. They are budget-friendly and often called “toy drones” which, in my honest opinion, puts them in a bad spotlight. The first mistake most beginners tend to make is going way too fast during their first flying session. Don’t be like them; don’t go all crazy with the throttle stick. Instead, wiggle it gently at first to get a proper feeling for your drone. After that, if you are feeling comfortable enough, it is time to rock it to around 50-60%… Push it too high and you will end up losing control, I guarantee it. Follow these tips and you’ll have a lot of fun with your best drone under $50. If you happen to crash your drone or, God forbid, break something during your first flying session, don’t be disheartened. Flying a drone (even fully stabilized ones) is a tough nut to crack for beginners. The learning curve is not that steep though, and with a little practice, I am sure you will get the hang of it in less than a week! After that first week, you will keep getting better and eventually able to land swift and precise turns like a champ! If you are having difficulties with learning the basics of flying outside, then perhaps it would be a good idea to give indoor flying a try. The latter provides a much easier learning experience without the negative effects of wind that can sweep the drone off its course. This is even more so if we take into consideration a plethora of microdrones featured on the list below. As a matter of fact, some of these birdies are indoor-only, meaning they don’t fare well with wind. Micro brushed racing quadcopters are getting a huge part of the market. This was not the case a while back when the tiniest racers you could find were at least 150mm. These days, however, such miniature drones are being equipped with powerful motors enabling them to whoop all over people’s homes without breaking a sweat. If that’s exactly what you are looking for in your first drone, then JJRC H36 is a no-brainer! First things first, JJRC H36 does not come with a camera. Still, considering its miniature size, who can blame this little birdie for not having a camera? Stick until the end though as I will give you a nice little trick to turn this birdie into a badass FPV racer! Being priced at below $20, people often think this is a bad investment that is going to break in a matter of days. However, that’s not the usual case since this birdie sports all around prop guards which make it bounce off of walls after crashing into them. It’s as safe as it can be in terms of people and objects. As a matter of fact, even if it breaks, it is easy to fix it since spare parts are available from virtually all web shops you can think of. The first thing you will notice on GoolRC T49 is its extremely weird design. Yes, this is a weird looking drone with a flat centerpiece and foldable propeller arms. It’s amazing to fly though – not too fast and not too slow. Perfect for beginners. It’s small too, making it an awesome companion for your travels. Not the best camera though, but it’s still good considering the price you’ll pay for it. Let’s continue with the camera. GoolRC T49 sports a miniature HD camera capable of recording in 720p resolution. There is actually not a lot of jello effect thanks to drone’s stability… But on windy days you can expect a fair share of it. When it comes to selfies though, this camera is more than decent. The images it snaps are bright, colorful and sharp. Even though the resolution is not that big, they’re still quite enjoyable. That’s partially due to Beauty mode which edits your shots and makes you look like a Holywood star. Oh, and I almost forgot, GoolRC T49 also sports headless mode which will do a world of good to first-time flyers. An interesting thing about this little bugger is its controllability. You see, you can either use your smartphone and control it via WiFi or use the included 2.4Ghz controller. Whichever you choose though, you will only get around 30 meters of range out of this birdie. Battery duration is decent at best. WiFi FPV and HD video recording take up a lot of juice meaning you will only get around 5 minutes of flight time per charge. Not bad, I know… but there are better options out there for people wanting the longest flight time out of their under $50 drone. TOZO Q2020 is a well-versed drone as far as features are concerned. There aren’t plenty of them, but the ones that are there make it a great choice. Altitude hold is obviously the most important one, allowing you an easy controlling experience. This is something beginners will love too, so if you’re one of them, TOZO Q2020 is a great choice. Another great thing is this birdie’s stability and responsiveness. The controller is great and every input you make instantly reflects on the drone’s movement. However, keep in mind that TOZO Q2020 does not come with a camera which is pretty much its only downside. Considering the fact this is a dirt cheap model (just like all others on this list), TOZO Q2020 actually has outright awesome specifications. Just take its range for example – not only can it do well indoor but outdoor too thanks to 50 meters of controlling range. It works via 2.4Ghz so it’s not surprising at all. As for battery duration, you can expect around 6 to 8 minutes with normal flying conditions. Akaso is not the most known drone manufacturer, but they do surprise us with a decent drone every now and then. Nothing different can be said about their newest model bearing the X5C nametag which looks like it was made up for it’s place on our best drone under $50 list. Of course, I’m sure you all realize that we are discussing an outright Syma X5C copy but with a couple of differences on the line. Let’s check them out and see how does Akaso X5C perform and is it really worthy of being on this list! First off, it needs to be stated that we are talking about a pretty small and lightweight drone that has a solid shock resistance due to its plastic prop guards that aim to decrease collision impacts. However, it is actually bigger than all previously featured drones, meaning that it can do equally well both indoor and outdoor. Don’t force it outside if there’s a lot of wind as it won’t be able to take it nicely. 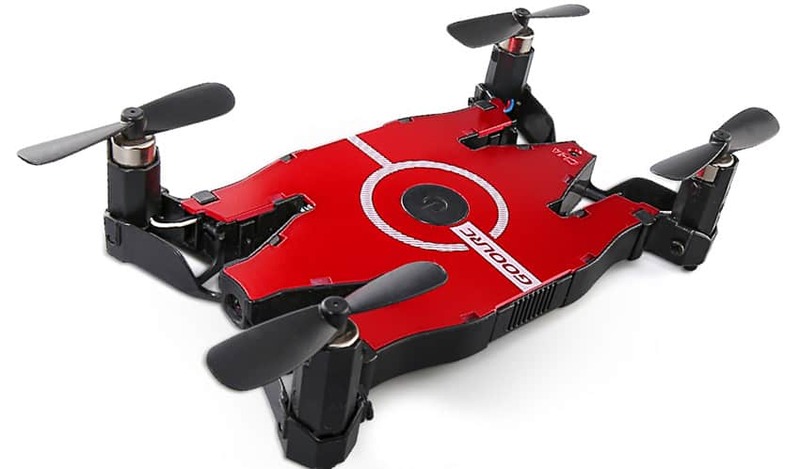 Other than that, it has a couple of handy features such as 360 flips, continuous roll, built-in LED lights along with an HD camera capable of capturing decent quality aerial photos and videos. After taking a sneak peek at its features, let’s see what is this bugger all about specifications-wise. First of all, you should know that Akaso X5C can last up to 6 minutes in midair and is able to travel around 60 meters away from its transmitter which is outstanding, especially considering its relatively cheap price of just over 40 bucks. So, if you are looking for something bigger than a palm-sized drone, then Akaso X5C is definitely worth checking out! At the 5th spot, we have JJRC H31, a very interesting drone that could, if it proves its worth, make quite the fuss in entry-level drone market. How come? Well, I don’t want to spoil the fun right away so this is what I’ll tell you – it has an interesting feature that very few (if any) entry-level drones have. Other than that, it’s actually pretty fast and agile. As a matter of fact, it’s one of the most enjoyable drones to fly out of this entire bunch. So, with all that in mind, let’s see what’s JJRC H31 all about… and what is so special about it! First of all, JJRC H31 does not come with a camera. You can mount one, but the standard package (which costs way less than our $50 cap) does not come with one. This makes it extremely lightweight and allows it to move really fast through the air. Plus, the jaw rate of this little bugger is so fast that I’ve had a lot of trouble controlling it at first. The big feature that I was telling you above is actually a mind-twister. You see, the biggest selling point of JJRC H31 is its waterproof design. Well, not actually the design but the coated electronics which cannot be damaged by water. So, if you happen to drop it into a pond, it seems as though JJRC H31 will survive and tell the tale. In terms of specifications, you are looking at pretty high numbers, especially considering the fact this is a dirt cheap drone. And it really is – cheaper than most others (if not all) on this list. So, as far as operating range goes, JJRC H31 will provide you with approximately 70 meters. Not too shabby by any means. Battery duration is not to be taken for granted either, coming in strong at roughly 8 minutes per charge. Charging will take an hour or so which is kind of a standard for 1S batteries of this capacity. 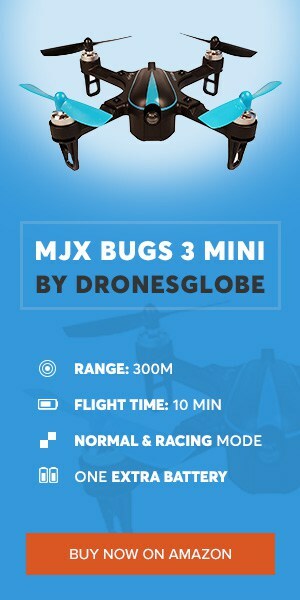 MJX is well known for pushing the boundaries with their drones. Take their Bugs 2W as the perfect example. A drone costing roughly $200 with GPS, altitude hold, FPV, extremely long range, return to home and even failsafe. Thanks to such great performance and affordable price tag, it’s no wonder Bugs 2W is among the most popular mid-tier drones right now. MJX X708 sports somewhat of a similar design although it’s slightly smaller. It costs just a fraction of the price but is still capable of providing with excellent flying experience. First of all, we need to get a couple of things clear – this is in no way a copy of Bugs 2. 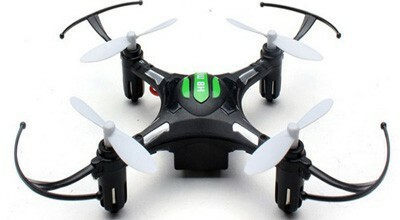 It is an entry level brushed quadcopter without GPS and all those GPS-powered features I listed above. However, it still packs exceptional range (more on that below) as well as the standard array of entry-level features such as 360 rolls, 2-speed modes, and headless mode. Additionally, MJX X708 also incorporates one key return. It’s not GPS powered but still works more often than not. As far as the camera is concerned, you should know that there are 2 versions available and the difference is roughly $10 – $15. Both come with a camera but the more expensive version also supports WiFi FPV. It’s kind of the same deal like with Bugs 2C and 2W. Now here is where things get really interesting. 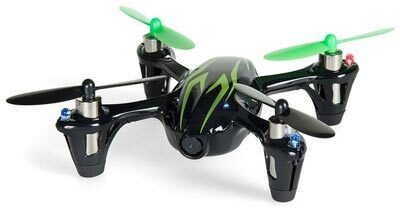 MJX X708 has an impressive range for an entry level quadcopter. Think of it as a more aggressive Syma X5C with up to 80 meters of range in a clear and unobstructed area. Crazy, huh? Well, it’s battery is great too, providing anywhere from 8 to 10 minutes per charge. It does take around an hour or so to fully charge it, but that’s just slightly over the average. All in all, if you’re looking for a cheap and reliable drone with impressive operating range, look no further – MJX X708 is the one for you! The bronze medal goes to Eachine E33C. Considering Eachine is one of market leaders as far as entry-level drones are concerned, it is not surprising to see 2 of their models featured in this list. If you scroll all the way up you will see their E52 model as well. But, now we’ll be focusing on E33C which is a micro brushed quad with interesting design options. Let’s dig straight into it and see what exactly does it have to offer! The first thing you will notice once you take a glance at this one is its legs. This, obviously, means that it sports a camera on the bottom portion of its body. We are talking about a 2MPX sensor that records videos in 720p. The quality is decent and you can even tilt it up and down, depending on what kind of flying you want to achieve with it. As for the features, Eachine E33C sports the likes of 360 flips, headless mode, and one key return. Needless to say, the latter is not GPS powered so you cannot bet on its pinpoint accuracy. Still, it’s good and has worked for me every time I issued the command. Last but not least, let’s see what is this little bugger all about when it comes to our favorite topic – specifications. First of all, I suppose I should say a thing or two about the battery. It’s a small 1S 450mAh LiPo pack which is nicely tucked away into a bay underneath the main electronics. This makes for a clean appearance and more durability than standard “hook” mounts we’re often seeing with entry-level models. It provides up to 8 minutes of flight time per charge. Not bad at all, right? Moving on to the range, thanks to the provided controller (2.4Ghz, of course), this thing can go as far as 80 meters away from you. Kind of crazy that we are seeing such high operating ranges from dirt cheap models. One last thing, the battery takes around an hour to charge but you can always get spare ones. If you do that, makes sure you take at least 10-minute breaks between each flying session to prevent motors from overheating. Finally, we have reached the ultimate drone that can be purchased for under $50! It is none other than the spectacular model made by Holy Stone. It goes by the name HS170 although many call it Predator due to its sleek design and sharp edges. But, in addition to its appearance, Holy Stone HS170 has a plethora of additional traits which are ranking it among the best-selling drones in this price range. The first reason is definitely that mini controller which is included in the package. It might not look like much at first, but it is actually capable of delivering responsive controls. Other than that, this controller is also in charge of turning the headless mode on and off and keeping the drone at bay for the entire flight duration. Not bad for such a miniature little devil, right? However, keep in mind that it does not come with a camera, which is an immediate turnoff for some people. Talking about size, even though Holy Stone HS170 is a tiny drone, it still has enough propulsion for outdoor flight sessions. Don’t put it up against too much wind though as that will result in getting it off course. In terms of flight time, Holy Stone HS170 can stay in the air for roughly 6 to 8 minutes which is the average number at this price point. 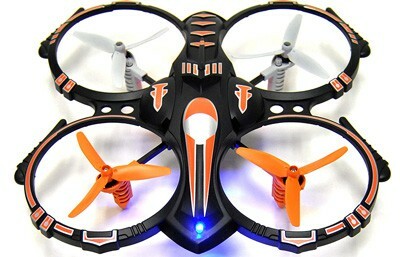 However, with its powerful motors, great design, and durable prop guards, it is bound to make a good impression on you. Why is Syma X5C-1 the best drone you can purchase for roughly $50? Well, how should I put it simply – it provides the best (by far) flying experience and has a whole bunch of supporting features. Its controller is a masterpiece. Geniusly made, highly intuitive and responsive. It’s a subject of copying ever since the original Syma X5C came out. Each and every single input you make – your drone will follow it instantly with no input lag present. What’s even better, Syma X5C-1 sports 360 flips and headless mode. The latter will give you an easy introduction to flying drones while the former will impress all your friends. The camera on Syma X5C-1 is no joke either. It has received a slight upgrade and is now an HD-ready sensor capable of recording videos in 720p. So, for all you future aerial photographers, Syma X5C-1 seems like a no-brainer! Especially so considering it has everything you need for aerial photography inside the package, including a 4GB microSD card. The first drone on this list of 10 best drones under $50 is a model made by Eachine. This is a widely popular RC drone manufacturer with lots of great drones to its name. However, they’re mostly dealing with toy-grade and FPV racing drone so their representation in high-end market is next to nothing. Look at it this way, Eachine has specialized their staff for making 2 types of drones… and my oh my, they are doing a great job! Just take Eachine E52 as an example and you’ll know what I am talking about. As far as controls go, Eachine E52 is actually very versatile. Not only can it be controlled with the provided transmitter but you can also control it via your smartphone. All you have to do is download the app, connect it to your drone and you’re good to go. Flying is rather easy and stable, but don’t expect high-speed acrobatics with this one. Once again, we’re talking about a mere selfie drone and nothing more than that. First of all, you should know that Eachine E52 runs on a 1S 500mAh LiPo. It’s a proprietary pack which provides up to 10 minutes of flight time (more like 8 if you plan on recording or taking photos) and takes roughly an hour to charge. Operating range is actually surprisingly good for a selfie drone – you can exceed 80 meters with this one… even go as far as 100 meters in a clear area. So, all things considered – if you’re just looking for an aerial selfie machine and you don’t want to break your bank, take Eachine E52 as a starting point. It’s stable, fun to fly and takes decent photos with its VGA camera. What can you expect from such cheap drones ? The first one is rather obvious and goes without much question. These cheap mini flyers serve well as beginner-friendly learning platforms and that’s an outright fact. They are intuitive, responsive and well capable of guiding you through your first steps in the world of drones. Even though they are relatively small and don’t possess powerful brushless motors, these birdies are still capable of providing you with a stellar all-around performance. Don’t expect too much though as their prices are a good reflection of their power. Comparing these baddies to premium models won’t do them much justice, but that’s only because they are meant for 2 completely different types of users. Another thing these birdies are great at is delivering worry-free flying to their users. That’s not only because they are cheap to replace (if they break) but they also possess weak motors and cannot do a lot of harm to people or objects. 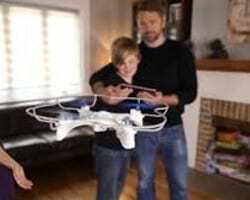 However, you should still supervise your children if they are learning to fly drones for the first time! Yes! Each and every single one of drones listed below can be considered as a children-friendly model. However, children younger than 7 are probably not the most suitable age group. On the bright side, children older than 7 are most4 likely to have a blast learning to fly these birdies. This is partially so due to the sheer simplicity of these models. They don’t possess any advanced features which are a must-have with premium ones. Nope! They just have a controlling board that has 4 motors attached to it with the addition of LED lights in some cases. Cameras are present as well, but they’re usually scarce (or produce terrible image quality) in this price tier. Basically, it all comes down to a simple conclusion – with an incredibly simple interface and responsive controls, these birdies are highly suitable for children. 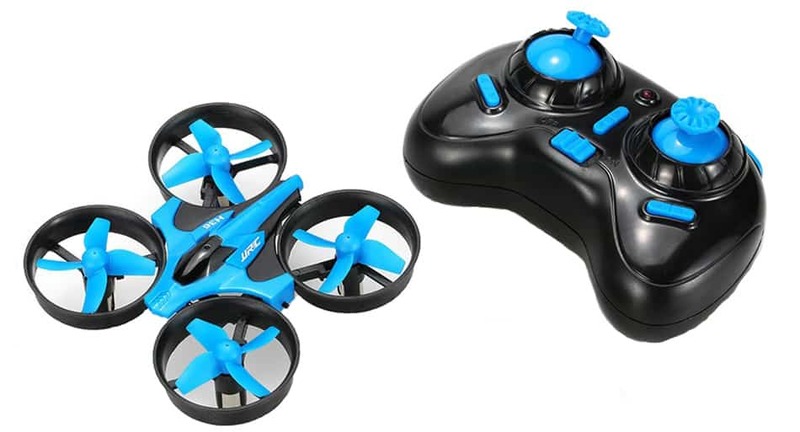 So, with that said, if you are looking to get your little ones a toy that will keep them away from their video games and smartphones, drones are your best bet! Do they come with everything needed to get them flying? Yes! All drones listed below come with everything you need to get them flying straight out of the box! All of them are RTF (ready to fly) drones which means you’ll only have to provide your own AA or AAA batteries (in some cases) for the controllers. As a matter of fact, not only do they come ready to fly but some of them even go out of their way to include spare parts. These will do you a world of good since you won’t have to order new ones as soon as something breaks. Extra batteries are a known factor too, but I suppose you won’t find many dirt cheap drones sporting them nowadays. Up the price tier to drones under $100 and such traits are looking more likely to be around! And there you have it guys! You had the chance to take a closer look at some of the best budget drones that are currently available on the market. As you could see for yourself, these cheap drones are not always as bad as people claim them to be. As is the case with pretty much all tech gadgetry, if you take enough time to do a proper research, you will find more than plenty of jewels among the dirt. In the end, I would like to thank you for reading through this list and sincerely hope that it helped you with your decision. Until next time – HAPPY PILOTING! Needless to say, it is making quite the name for itself on the market with its incredibly compact size, decent specifications, and a dirt-cheap price. For the price of one restaurant meal, you will get a super small drone that you’re able to fly around indoors. Sure, you can fly it outdoor too, but it’s really lightweight and if there’s even a smallest of breezes, it will tamper with its sensors and render it unflyable. Specification-wise, it can last up to 6 minutes in midair which is great considering it needs to charge for just over half an hour. Its control range is great too – it can reach up to 30 meters but I doubt you will ever let it wander off that far away because you won’t be able to see it at such a huge distance. All things considered, if you want a small drone that you can use for practicing without having to worry about breaking it, the Cheerson CX-10 is a great choice! The second drone on this list is made by Eachine. 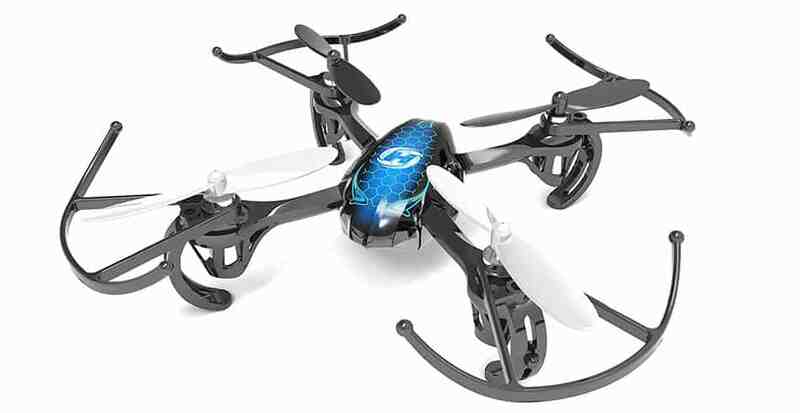 Their H8 model is another miniature drone (a bit bigger than CX-10 due to its prop guards reaching far out from the rest of its build) which has headless mode, bright LEDs, one key return to home and 3D tumbling features. Obviously, we are talking about nice additions to such a cheap drone. But, on top of that, is there anything else noteworthy about this miniature flyer? Well, for starters, Eachine H8 is extremely lightweight which can be a problem if you are planning on flying it outdoor. H8’s flight time is around 7 minutes while his flying distance is about 30 meters away from its transmitter. Do you think this is the best drone under $50? Well, perhaps you will when I tell you how nimble this little bugger is. You see, not only is it lightweight and small but it has no input lag making it highly responsive. Plus, it sports a tiny controller that first into children’s hands perfectly. That’s, of course, bad news for adults who think of buying this little birdie… but in reality, it is meant primarily for younger audiences. This interesting looking drone kind of resembles an actual spider with its prop guards that are reaching downwards from the propellers. As a matter of fact, not only are its prop guards facing downwards but motors and props too, making up for a rather unconventional appearance. Needless to say, prop guards serve as an extra layer of protection in case you happen to crash your drone somewhere. Furthermore, crashes shouldn’t really be an issue since this birdie is lightweight and will simply bounce off after hitting walls and similar objects. With that said, let’s take a closer look at this cool looking birdie and see what’s it all about! With 2 bright LEDs, 2 speed modes (slow and fast), 3D tumbling and good stabilization, there Is no doubt that the X902 will provide you with a great deal of fun. 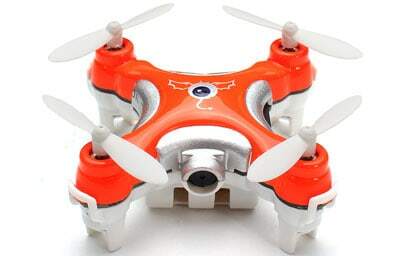 When it comes to its specifications, you will be happy to know that it can fly up to 7 minutes and reach more than 30 meters without any sort of lag issues. On a side note though, considering we are talking about a palm-sized drone which doesn’t have a lot of propulsion force (or weight), it might be a good idea to keep it for indoor-flights only. Hubsan has made yet another amazing drone that will amaze you with both its features and specifications. Of course, it has the industry standard 6-axis gyro, but in addition to that, it is equipped with a VGA camera module that is able to record decent quality aerial footage. That’s right, Hubsan X4 H107C sports a miniature camera! However, it does not come with a memory card which means you will have to grab your own (works only with Micro SDHC cards). Moving forward, this little birdie is made out of sturdy, lightweight material which in combination with its powerful motors enables it to fly pretty fast. Still, don’t expect it to reach speeds of racing drones, but given his small size, you won’t find many similar ones that can go faster. Specification-wise, Hubsan X4 H107C can last up to 7 minutes in air and can travel around 90 meters away from its transmitter. This number is amazing, especially for this price range in which most of the drones cannot go more than 50. So yeah, Hubsan X4 H107C can be considered as a dirt cheap exploration drone… if you are able to see it at such a huge distance. Another cool thing about this drone is that it offers live FPV with its 0.3MP camera which is an outstanding feature in this price range. You won’t see many drones under $50 that offer this. In addition to this, it is also important to add that it is equipped with headless mode, 2 speed modes (beginner and experienced) and one key 360 rolls. As a matter of fact, I believe Hasakee Mini is among the best value for money drones in this department, mostly due to its great build quality and the presence of a camera, no matter how low quality it might be. And finally, Hasakee Mini doesn’t disappoint in specification department either. With up to 7 minutes of flight time and more than 50 meters of lag-free range, it justifies its place on this list. Great looking drone with plenty of features and admirable specifications – what else could you want from a drone that costs just over $35? While most drones today (if not all of them) are equipped with LED lights, the UFO 3000 takes it one step further. 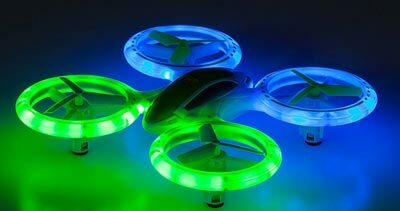 It has amazingly bright LEDs that go all the way around its propeller guards for maximum visibility. In other words, if you want to make sure you can clearly see your drone during even the darkest of nights, then go for the UFO 3000 and you won’t be disappointed. Besides its extremely bright LEDs, this little fella is able to do 3D stunts, one key 360 flips, and 2 speed modes. When it comes to its speed, you will be surprised at how quick and agile this drone is. Another great virtue of the UFO 3000 is its flight time which goes around 7 minutes. Considering the fact that it comes with 2 batteries, that means you will get a total 14 minutes of flight time if you fully charge both of them. However, keep in mind that the range isn’t exactly its biggest virtue. With only 30 meters to go around with, it’s kind of disappointing you can’t share this fluorescent birdie with all your neighbors. It has 4 built-in prop guards that go all the way around its propellers and make up for its beautiful appearance. Other than it looks, this little fella is not going to disappoint you with its features because it has a whole bunch of them. Starting off with screw reinforced propellers and adjustable speed, all the way to one key 360 rolls and a generally durable frame that is able to endure a lot of crashes. Specification-wise, it can last up to 6 minutes of flight time but can only reach cca 30 meters which is its only drawback. Come to think of it, the airtime isn’t exactly its biggest virtue either, but considering this drone is a bit bulkier than others on our list, 6 minutes is decent at best. So, with all that taken into account, I believe it is pretty clear that RC Stunt drone is one awesome little bugger well worth further inspecting. I find all this info helpful. I have never been on drone website so good. I am a drone geek and all your info is very helpful. Thanks! where is JJRC H31 ?! I think you people have overlooked the Yi Zhan Tarantula X6 one of the best selling beginner drones ever made with a GIANT active community. It's speed, carrying capacity and durability can't be touch at it's price point. Don't take my word for it try going over to RCgroups and read the nearly 9000 active comments on this awesome drone. When your drone starts having other companies cloning your design you know it's a winner. Hey Shawn. Thanks for the Info. I have 3 Sons and bought a couple different Drones for around 50.00. I forget the names, Safstar SYMA X5C RC Quadcopter and a Gemini something (forgot the name)... They are actually pretty cool and my wife got them on sale for like 30.00 on Black Friday. I will check the Yi Zhan Tarantula X6 out. Take Care and Happy Holidays ! !